Buy New Garmin Ndegreesvi Malaysia At FotoZZoom! The sleek Garmin Nüvi 52LM offers dependable, easy to use driving guidance with its bright 5.0” display, spoken turn-by-turn directions and many innovative features. It includes maps of Singapore/ Malaysia, plus free lifetime map updates that let you easily find addresses and great numbers of points of interest. Never get lost again as the lane assist with junction view indicates the proper lane for a turn or exit with brightly coloured arrows and detailed pictures. Nüvi 52LM also displays speed limit and accurate arrival time. 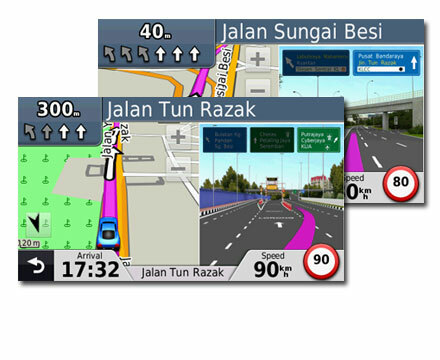 The new UI redefines the user interface and search engine of navigation system. No more guessing which lane you need to be in to make an upcoming turn. Real view junction view guides you to the correct lane for an approaching turn or exit, making unfamiliar intersections and exits easy to navigate. Use Garmin Express to keep your Nüvi up-to-date. Garmin Express makes it easy to update maps and software, transfer favourites to and from devices, and install free custom vehicles and voices.